Yamaha MCR-640 review | What Hi-Fi? A lot of systems have their own twist to set them apart from the pack. In the case of the Yamaha, there are two. One is that this is part of the company's Piano Black range, with a speaker finish drawing on the company's piano-making experience; the other is the fact that the main electronics come in two parts. What we have here is a DAB/FM receiver, the R-840, complete with two line inputs and an iPod dock, and claiming a power output of 2x65W. Double the fun? Double trouble? Plugged into it, using conventional analogue phono leads for audio and a multipin mini-DIN-terminated control cable, is a standalone CD player, the CD-640. The two are the same size, and so will stack or sit side by side. There are basic disc-management controls on the player, plus a USB input to allow memory devices to be played. The receiver has large input and volume controls, prominent tone and balance knobs, and a few ancillary buttons scattered around. All of which leaves us with one simple question – why? 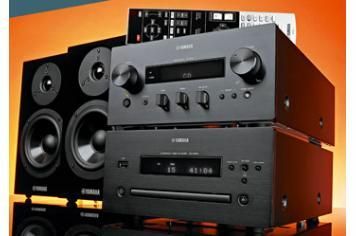 The system needs two mains sockets, and while we can see the logic in having the USB input on the CD player, so the same DAC can handle the digital sources, Yamaha's still doubling up: the receiver DAB, and thus another DAC and yet an analogue iPod dock. True, the receiver has Pure Direct switching, bypassing the tone controls, but it's not as minimalist as the simple controls on the front panel would like to suggest. The NS-BP300 speakers, meanwhile, look the business, with their glossy cabinets, big 13cm bass driver tuned with a rear-venting port and 25mm soft-dome tweeter. Even the clip-on grilles are classy, being shaped around the drivers rather than just a rectangular lump of acoustic cloth on a simple frame. You can buy the system without the speakers and save about £70, but that would seem to miss the Piano Black point. Mind you, whether used with the standard speakers or some decent budget alternatives, the Yamaha is never entirely convincing. The sound is over-rich, lacking in top-end bite and openness, and rather subsumed in excessive bass warmth to give a presentation that's more 1960s radiogram than modern micro. Driving rock suffers from a rather one-note character in the bass, and fails ever to spring free from the speakers, and while swapping for some speakers with a bit more drive helps a bit, things never quite get beyond easy listening and into miniature hi-fi. This system is a bit of a disappointment in a sector of high achievers. We've heard much better from Yamaha systems in the past.